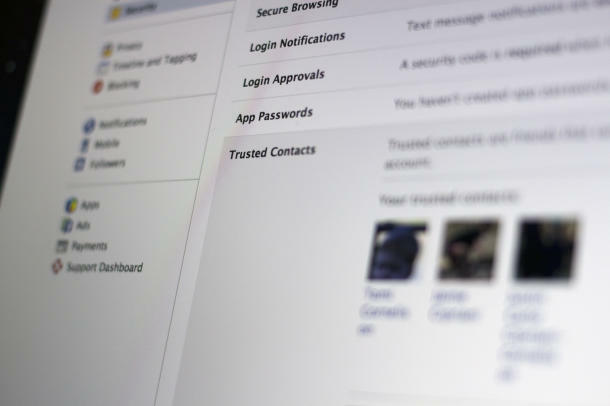 Last week Facebook introduced a new security measure in case you were to ever lose access to your account. This feature is Trusted Contacts, where you can select three to five of your closest friends to help you regain access of your locked account. To get started, login to your Facebook account and go into your Account Settings, then Security. From there, click on the “Choose Trusted Contacts” link. Next, you’ll be given a basic description of what Trusted Contacts is, click on Choose Trusted Contacts again. On the next screen, start typing the name of your friends you want to add. You add them all at once, then click confirm. You’ll need a minimum of three contacts and a maximum of five. Keep in mind when adding more than three names to the list that you’ll need a private code from each contact before you can gain access to your account. And each person can only get the code by accessing Facebook. Don’t add someone who doesn’t get on Facebook all that often, or someone who is likely to take a while to get back to you. 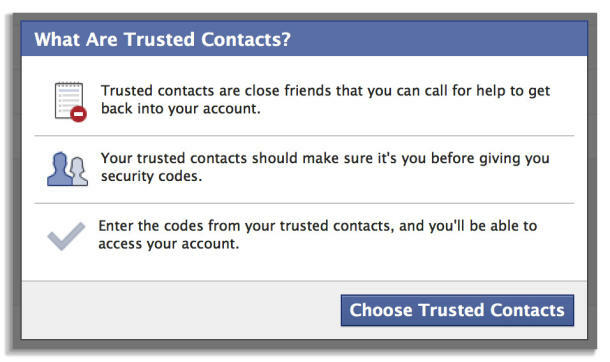 Should you ever need to have your Trusted Contacts help you get access to your account, you’ll need to ask all of them to visit Facebook.com/recover. There they’ll be asked to verify that it’s really you asking for the code. Once they have it, they can pass the code along to you, which you’ll then need to enter in order to regain access to your account. Again, you’ll need all of your Trusted Contacts to go through this procedure before you can access your account. So if you have five people on the list, you’ll need all five codes.